If the Republicans really think refusing to raise the debt ceiling will somehow create better government, they are just insane. That will be a sure-fire way to creating massive deflation and economic chaos beyond description. They fail to comprehend that this is not the way to stop spending; it is the way to create unbelievable economic suicide. Refusing to raise the debt ceiling would mean no interest on past debt could be paid and that means international DEFAULT. Interest rates will soar and nobody will trust the US again threatening the status of the dollar as a world reserve currency. Are they serious? Should the world economy always be held hostage to local political nonsense? The Obama solution will only be some executive order that unilaterally raises taxes to pay at least the interest. He has that power. We are at record lows in interest rates for 31+ years. This looks like the reason for the change in trend that is coming. They are drawing the attention of the world to the Sovereign Debt Crisis. On Friday, sources inside the Republicans indicated that rank-and-file members should expect a knock down drag-out fight and this could be the catalyst that starts the ball rolling back to higher interest rates. House Speaker John A. Boehner (R-Ohio) has been preaching that Republicans should stand firm, articulating the strategy that for every dollar they raise the debt limit there should be a paired commensurate spending cut. However, other Republicans are realizing that there is tremendous pressure from the business community and the public to raise the $16.4 trillion federal borrowing limit. Refusal to do so will only start putting the lid on the coffin of the Republican Party. In an appearance Friday on MSNBC’s “Morning Joe,” former House speaker Newt Gingrich (R-Ga.) has been typically throwing his two-cents into the pot and warned the GOP about waging a showdown over the debt ceiling. Gingrich called the strategy a “dead loser” for the GOP. If these Republicans really think a showdown over the debt ceiling will accomplish anything, they had better wake up to the ramifications of not passing a debt ceiling increase would have BEYOND the shores of the United States. Clearly, Congress seems to be doing business always by crisis management in eleventh-hour deals with the threat of shutting down the government where bills are signed without anyone reading the details. In an op-ed by Senate Minority Whip John Cornyn (R-Tex.) published Friday in the Houston Chronicle, he argued that Republicans should be prepared to force a partial government shutdown to extract concessions from Democrats on significant spending cuts and entitlement reform. This is a typical domestic myopic perspective. This is like having cancer and taking two aspirin He has no idea what this will do on an international level. Nevertheless, herein lies the seeds of political stupidity that will be the thrust that reverses the downtrend in interest rates for 2013. Cornyn wrote: “It may be necessary to partially shut down the government in order to secure the long-term fiscal wellbeing of our country, rather than plod along the path of Greece, Italy and Spain.” Two other prominent GOP conservatives, Sen. Pat Toomey (Pa.) and a newly elected Sen. Ted Cruz (Tex. ), have made similar arguments recently. 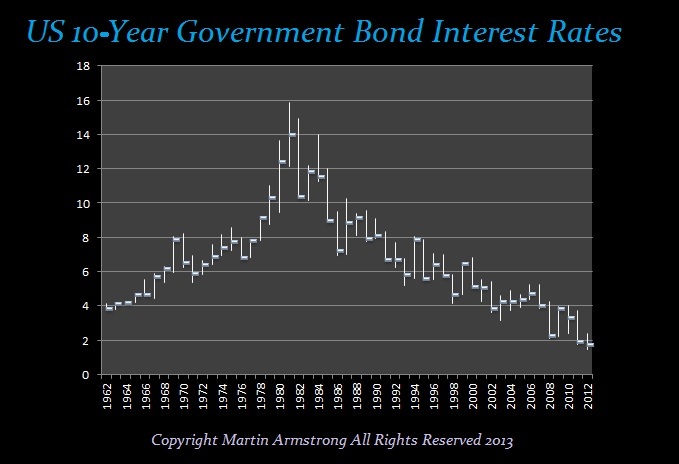 Clearly, 2013 should be the year for the low in interest rates. Whatever these people do, they will do it like the perfect storm. There has to be real economic reform. Refusing to increase the spending limit will do what exactly? Stop spending forever? Hello? The debt still has to be rolled and if you stop ALL spending, you still have to pay the interest or default. Unless we are going to sit down and really examine the whole process, we are standing on the threshold of a catastrophic rise in interest rates. Once those rates begin to rise, small increases are now a huge potential fueling the fire that will make the debt rise faster now than it ever has in history going into 2016. Any uptick in interest rates will effect banks on a global scale. So hang on tight. We are going for a ride in 2013 that will be the best roller-coaster ride of your life.